Collar NJ, Stuart SN. 1985. Threatened birds of Africa and related islands. 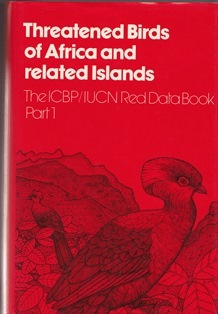 ICBP/IUCN Red Data Book, Part 1, 761 pages. This publication is a Red data book of African birds, covering 177 species in the main text. Each species account has a brief Summary, detailed Distribution, Population, Ecology, Threats, Conservation Measures Taken, Conservation Measures Proposed, concluding Remarks, and a list of References. The weaver species included in the main text are: Bannerman's Weaver, Bates's Weaver, Black-chinned Weaver, Loanga Weaver, Lufira Masked Weaver, Clarke's Weaver, Golden-naped Weaver, Yellow-legged Weaver, Usambara Weaver, Ibadan Malimbe, Gola Malimbe, Mauritius Fody, Seychelles Fody, and Rodrigues Fody. Texts for the weavers are generally 1-2 pages long except the fodies which have 5-6 pages each. Fox's Weaver has a paragraph in Appendix C (near threatened species). In addition Appendix G lists potential candidate species for inclusion and lists the following weavers: Strange Weaver, Taveta Golden Weaver, PrÃ­ncipe Golden Weaver, Giant Weaver, Yellow-capped Weaver, Sao Tome Weaver, Rufous-tailed Weaver, Rachel's Malimbe, Golden-backed Bishop, Hartlaub's Marsh Widowbird, and Jackson's Widowbird. The center of the book contains 12 plates of selected endangered species, including one of the Golden-naped Weaver.